HOLD THESE TRUTHS closes this Saturday at NCT - if you haven't seen it yet, I recommend it. It's a powerful story, beautifully told. 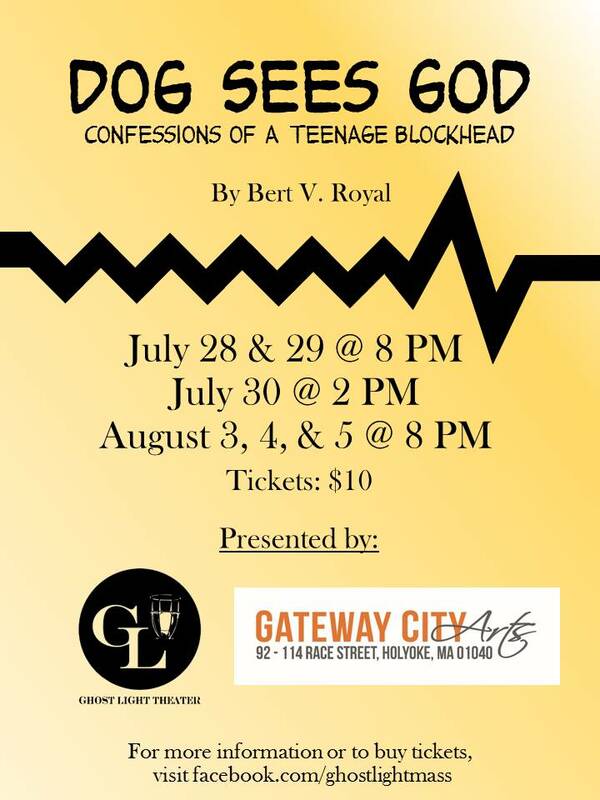 DOG SEES GOD closes this weekend - don't miss your change to see Ghost Light Theater's latest at Gateway City Arts. Looking for a show to be in this fall? Audition Appointments are now available for Amherst Leisure Services Community Theatre. Call 413-259-3065 to sign up! Beauty and the Beast Audition Slots Available! Several forces have contributed to the erosion of sustainable models of journalism, and arts writers and reviewers have been hit particularly hard. This has affected theatres that depend on third-party coverage for promotion and professional reviews. In addition, the cry for more diverse voices writing theatre opinion pieces has become more urgent, in light of the controversy surrounding the Hedy Weiss review of Antoinette Nwandu’s Pass Over. The forced relocation of Japanese-Americans into internment camps through executive action by the President during World War II remains one of the most flagrant violations of civil liberties in American history. 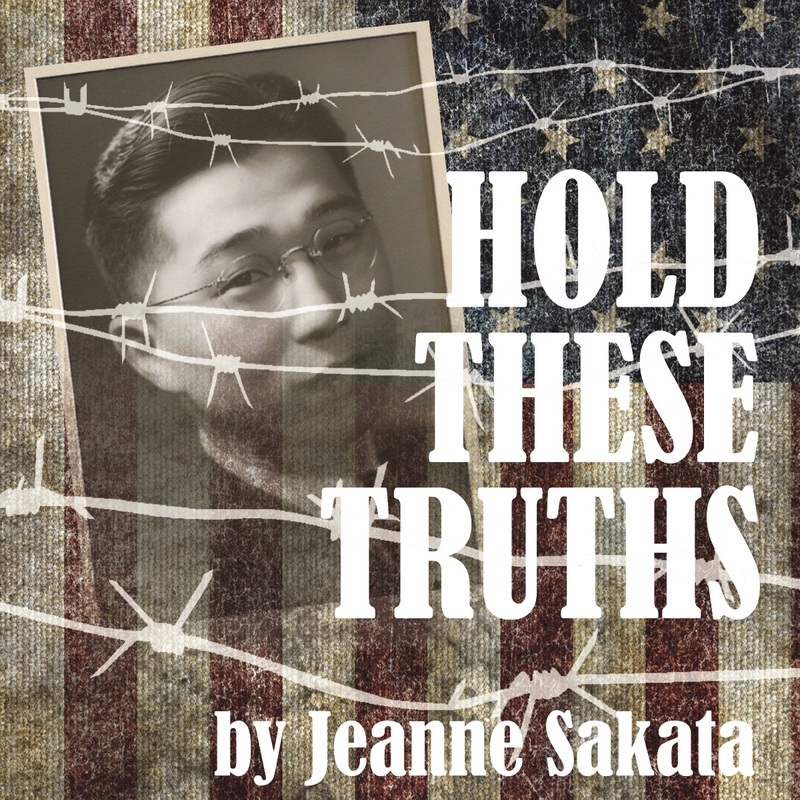 HOLD THESE TRUTHS is inspired by the true story of civil rights pioneer Gordon Hirabayashi, an American sociology student who fought against the violation of his family’s constitutional rights. His story is a 50-year journey of standing up for U.S. Constitution and confronting a culture of fear and prejudice. Tickets at 413-587-3933 or online. This contemporary production of William Shakespeare's Hamlet will use this classic text to explore the cycles of abuse at play within the story and how they manifest supernaturally. By employing immersive staging and utilizing the full potential of this outdoor space, this show will take the audience on a journey through the haunted halls of the decadent Danish court, examining the trials and tribulations of those who dwell there. From the traumatic effects of a murder that destroys a country to the behavior of the Prince himself, this play explores the affects of madness on both an intimate and political level. When CB's dog dies from rabies, CB begins to question the existence of an afterlife. His best friend is too burnt out to provide any coherent speculation; his sister has gone goth; his ex-girlfriend has recently been institutionalized; and his other friends are too inebriated to give him any sort of solace. But a chance meeting with an artistic kid, the target of this group's bullying, offers CB a peace of mind and sets in motion a friendship that will push teen angst to the very limits. 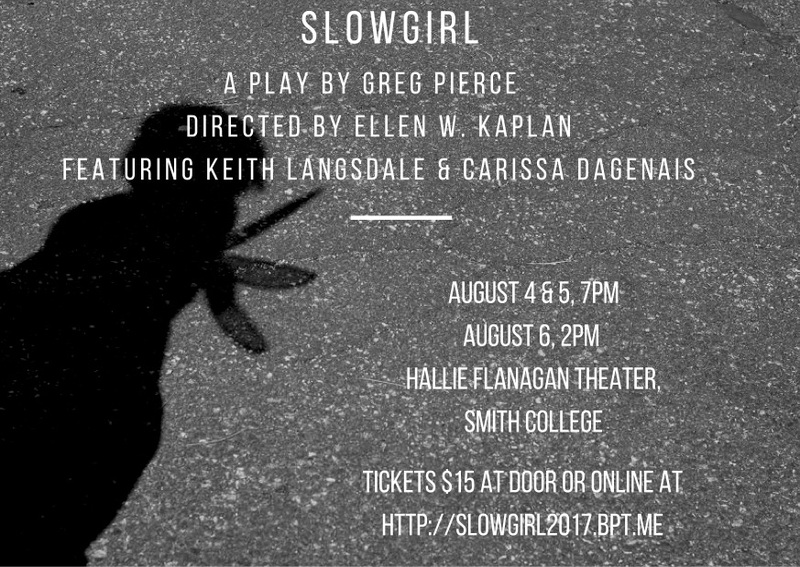 Drug use, suicide, eating disorders, teen violence, rebellion and sexual identity collide and careen toward an ending that's both haunting and hopeful. All tickets are $10 and are available at the door or online through Eventbrite. Please note that this show is intended for mature audiences only. Facebook event here. Rosencrantz and Guildenstern are Dead is playwright Tom Stoppard's philosophical-comedic reaction piece to Shakespeare's greatest work. Through the eyes of two of Hamlet's minor characters, we see the story from another angle as the politically powerful step on everyone beneath them. This contemporary staging will get up close and personal, inviting the audience to laugh and ponder with our heroes as they explore identity, truth, and what might really be rotten in the state of Denmark. 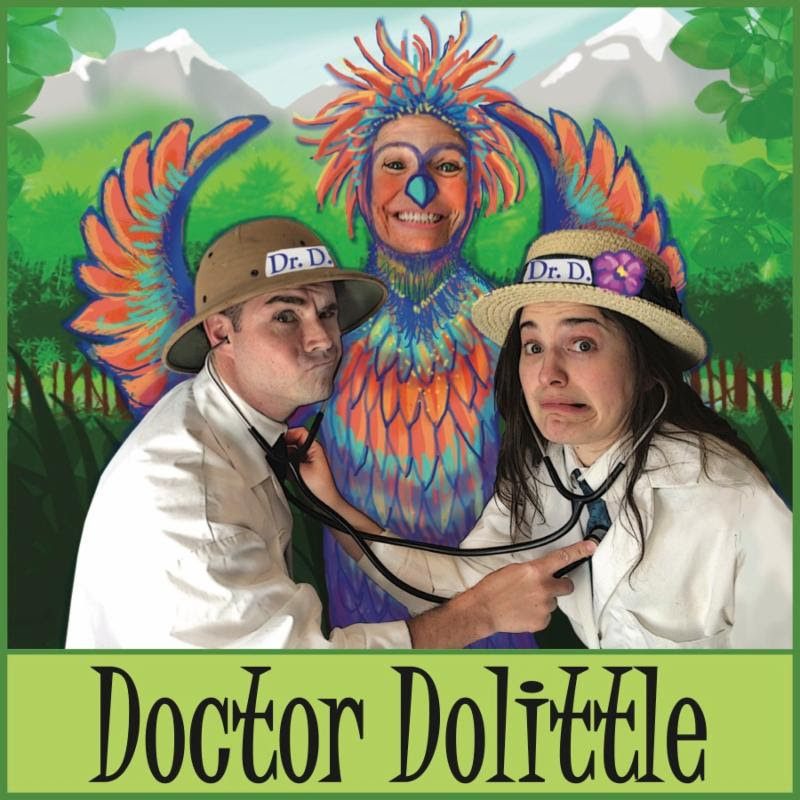 Friday August 4: 7:00 p.m.
Saturday and Sunday, August 5 and 6: 10:30 a.m. and 1:00 p.m.
We close our season with Doctor Dolittle—the delightful tale of a kindly doctor who learns he can speak “animal.” No matter the species, our doctor knows what they are saying and what they need to get well. Be prepared: we’re off on quite an adventure. We’ll travel the high seas, visit Africa, and even face pirates. We’ll meet animals of all sorts. Everyone will take a turn—in fact, the audience will play birds, sharks, wild beasts, cats, dogs and even a flying fish. Audience member should arrive early if they want a role. Our cast include PaintBox favorites Troy David Mercier, Linda Tardif, and Kelsey Flynn. Ko Festival of Performance presents THE SOCIETY OF CIVIL DISCOURSE by Team Sunshine Performance Corp & The Philly Pigeon. An interactive performance event that gives people a chance to have fun in community, with art at the center. You can come and quietly watch the entire night, or you might take us up on this opportunity to show off your best rhetorical skills. You'll have the opportunity to learn to love the people you argue passionately and celebrate the pleasure of passionate debate in a safe and festive space where you can indulge in ridiculous oratorical muscle-flexing! You might even be tapped for the Great Debate that concludes the evening. Think town meeting — with a serious dose of the silly! Tickets $15 adults; $10 EBT/SNAP; Ltd $8 dos. Part of Ko Festival of Performance, celebrating its 26th season, a perennially popular summer theater experience in Western Massachusetts. 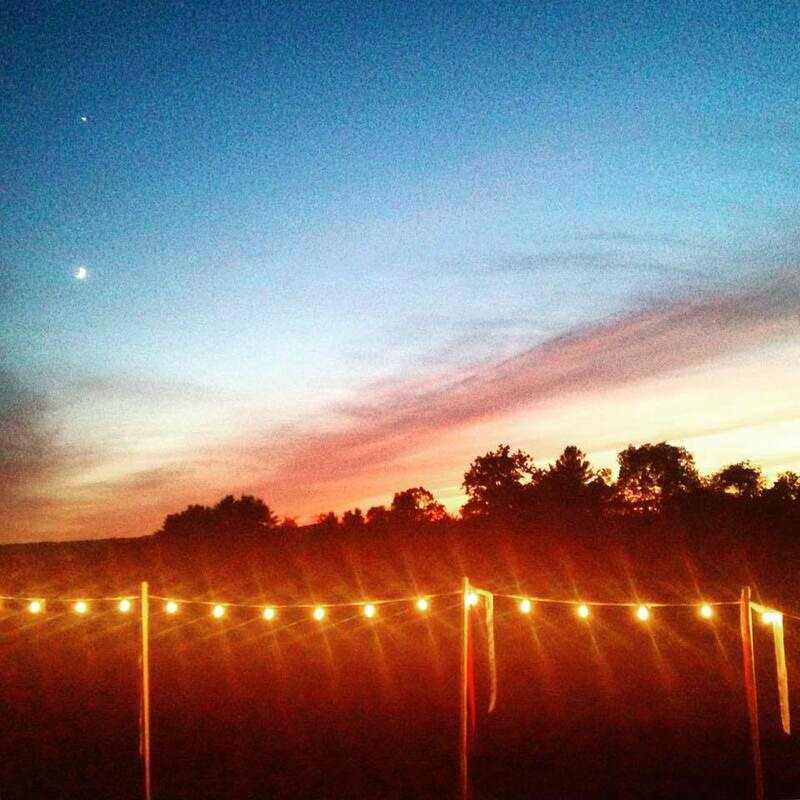 July 3-August 6 on the beautiful campus of Amherst College. KoFest presents four weekend theatrical performances, one outdoor all-ages event, Story Slam and three 6-day intensive theater workshops. A teenager flees to her reclusive uncle's retreat in the Costa Rican jungle to escape the aftermath of a horrific accident. 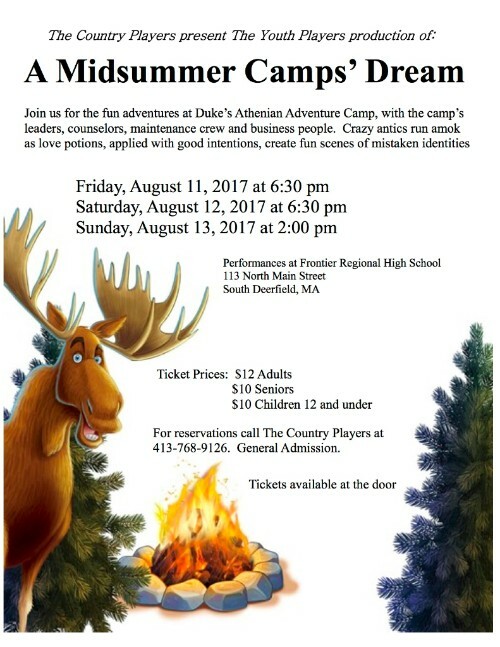 The Country Players Youth Production of "A Midsummers Camp's Dream" will be performed by our youth actors whose ages range from 8 to 18. A fun farce taking place at Duke's Athenian Adventure Camp. 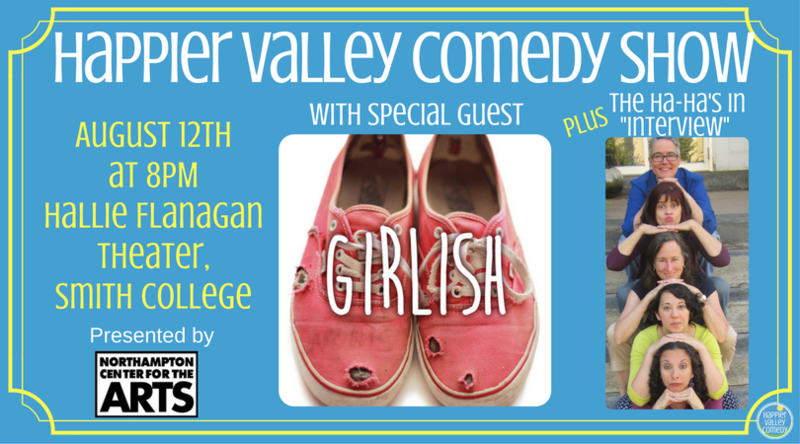 Presented by Northampton Center for the Arts, the Happier Valley Comedy Show on August 12th features special guest GIRLish all the way from Chicago! Stephanie Anderson and Alex Bellisle make up the Chicago-based improv comedy duo GIRLish. Stephanie and Alex have been performing together since 2012 at Second City, iO Theater, and around the country. They are improvisers, writing partners, and friends. They have written and performed original sketch at the NYC International Fringe Festival. As an improv duo, they weave grounded characters with a little bit of absurdity and a lot of fun! Plus, Valley favorites The Ha-Ha's perform "Interview." You may be the inspiration for The Ha-Ha's show this month as they welcome three audience members to the stage to be interviewed about their real lives for a few minutes. 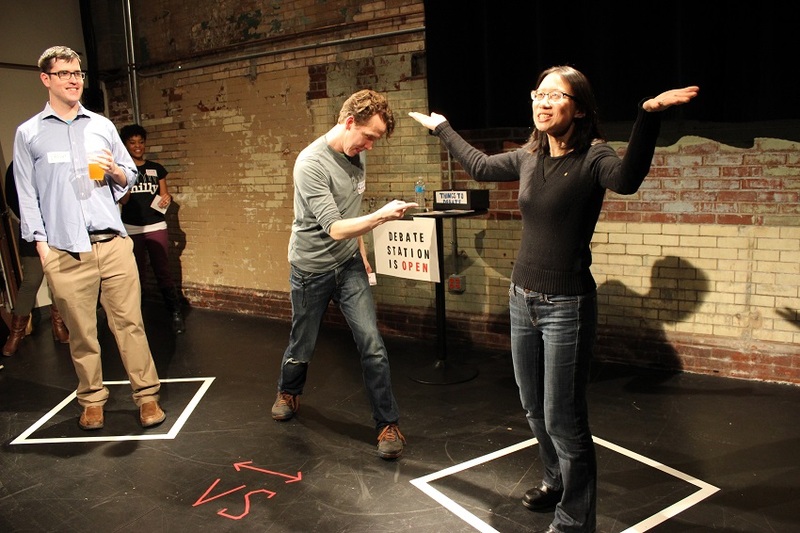 Then these talented improvisers will use that information to inspire their silly scenes. Come be part of the Interview! Tickets available at the door for $13. Door opens at 7:30pm. More info. More Improv, More Better Improv Jam & Showcase (Happier Valley Comedy) - Open improv jam for everyone and anyone to play and watch improv games, plus a showcase set featuring Tomfoolery Productions, a brand new sketch comedy and improv troupe based in Holyoke. Free show. Suggested donation: $3-5. For more info. 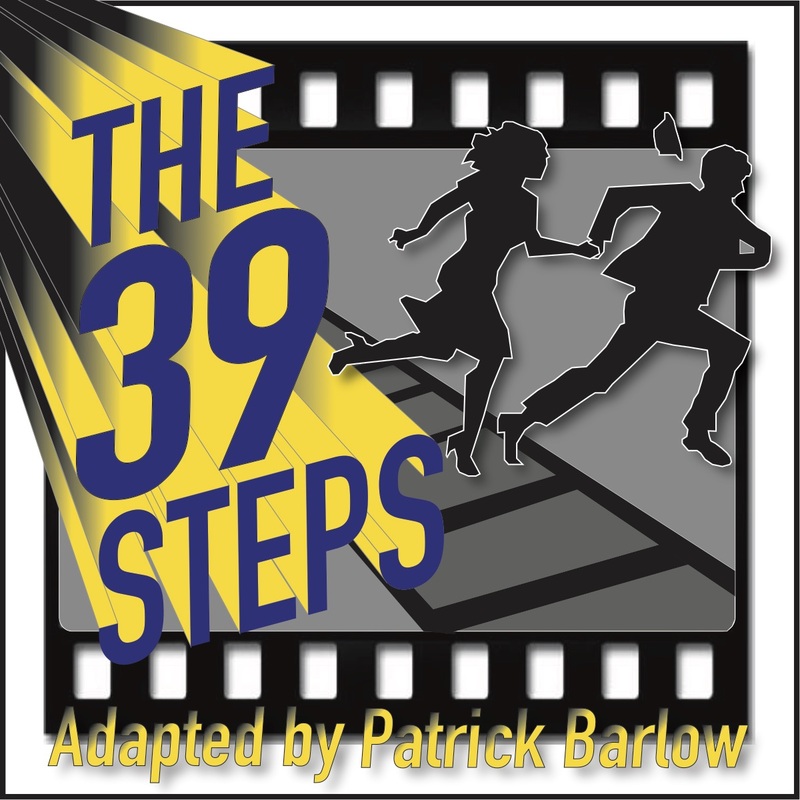 Two parts vaudeville style comedy, one part classic Hitchcock masterpiece, and a dose of edge-of-your-seat spy thriller, THE 39 STEPS is a raucous whodunit for theatre lovers everywhere. A man with a boring life meets a mysterious woman and is soon embroiled in international espionage culminating in a death-defying finale. This Tony Award-winner is a fast-paced delight packed with nonstop laughs and over 150 characters played by just four actors. The New York Times calls it, “Theatre at its finest!... Absurdly enjoyable! This gleefully theatrical riff on Hitchcock's film is fast and frothy." THE 39 STEPS, with its wildly inventive stagecraft, is an unforgettable evening of pure pleasure. Tickets available here or by calling 413-584-9032 x105. Happier FAMILY Comedy Show: Monthly family-friendly improv comedy show, best for 5-12 year olds and their adults. New Location! New Time! Saturday, August 19th at 3-4pm at The Eric Carle Museum of Picture Book Art, 125 W Bay Rd, Amherst. Tickets at the door: $10/Adults, $5/Kids, Free/3 yrs and under. For more info. Happier Valley Comedy is now hiring! Looking for an Executive Assistant and a School Coordinator, or some fantastic soul interested in being considered for both positions. Feel free to share this notice or have your super awesome friends reach out to me at pam@happiervalley.com. EXECUTIVE ASSISTANT & SCHOOL COORDINATOR at Happier Valley Comedy: Small, non-profit, improv comedy company in the Pioneer Valley, Mass. is seeking a super efficient, highly organized, and focused executive assistant for this part-time job with growth potential. Beginning August 22, 2018. FOR MORE INFO ABOUT ONE OR BOTH OF THESE JOBS, EMAIL pam@happiervalley.com. The producer will assist in creating a budget, hiring administrative staff, and overseeing the two Mainstage shows and Young Company show. Contract begins immediately and completes after the Board retreat, which is held no later than September 2018. Please send resume and cover letter to hampshire.shakespeare.company@gmail.com. Accepting applications through August 31, 2017. While Hampshire Shakespeare is a community theatre, the company offers a small stipend for much of its production staff. All stipends are commensurate with experience and company budget. Eastworks is a 500,000-sq.-ft. mixed-use, revitalized mill. We are a dynamic community of artists, designers, craftspersons, tech and software firms, wellness-centered businesses, nonprofits and community-based organizations. We have a long history of fostering community by offering exciting, flexible spaces for events large and small, public and private. The Assistant to the Event Coordinator will work closely with the Event Coordinator and the rest of the Events team to assist clients with preparation for events, which include weddings, theater performances, screenings, art shows, fundraisers, meetings and cultural events in three unique venues at Eastworks. The candidate will be a personable, diplomatic, detail-oriented and adaptable problem solver who possesses excellent communication skills (written and oral). This is a great entry-level opportunity for a recent college graduate in hospitality, management or a similar field. This is a part-time position (20 hrs/week) with possible additional hours; must be available to work weekends and evenings as needed. Compensation: $15.00/hr. Please send cover letter and resume to events@eastworks.com. 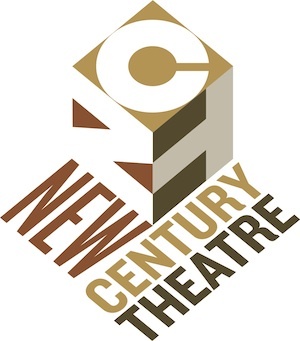 Performances are August 17-20 at the Academy of Music in Northampton. Dressers will also be needed for tech on August 15 and 16 and in rehearsals the week prior. Dressers are eligible for EMC points through Actor's Equity Association. For more information send an email. Pioneer Valley theatre groups: Did you know that Smith Vocational High School (80 Locust St., Northampton) has a gym with a stage--and that this space can be rented by community organizations? For more information, visit their website. Audition phone lines are LIVE for ALSCT's BEAUTY AND THE BEAST! Call Amherst Leisure Services at 413-259-3065 for your appointment! 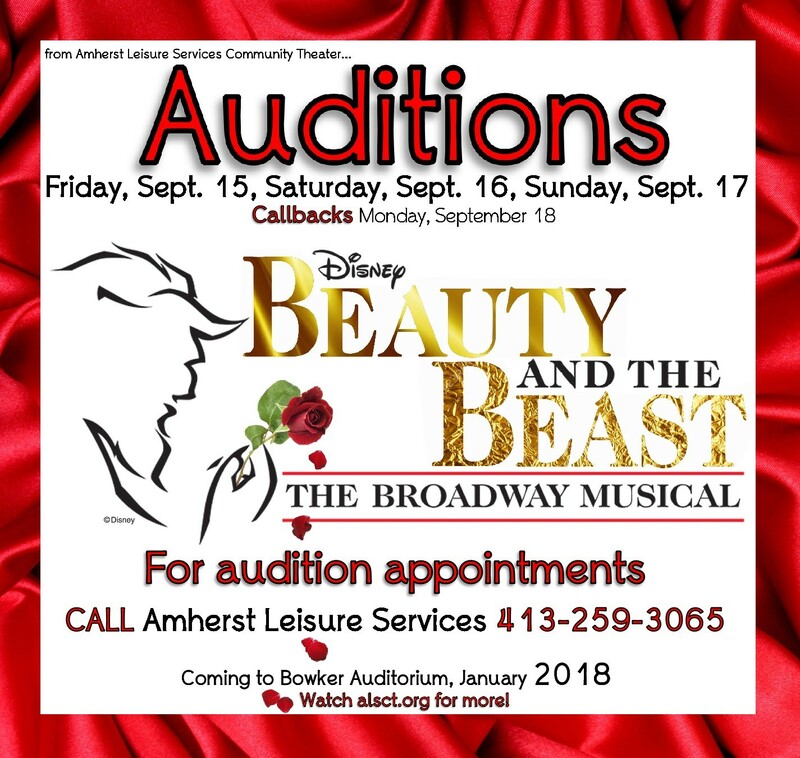 Amherst Leisure Services Community Theater (ALSCT) brings Disney’s Beauty and the Beast, the classic “tale as old as time” to the UMass Bowker Auditorium stage in January, 2018. Lavish sets and costumes, a full live orchestra, and enthusiastic audiences fill the 600-seat theater for nine performances. Actors, singers, and dancers ages 7-107 are encouraged to audition. ALSCT strives to be inclusive in casting and welcomes talented performers and theater enthusiasts of all backgrounds to participate in auditions and/or be a part of the behind-the-scenes team. For more information, see www.alsct.org. Youth Drama Programs taught by Becca Greene-Van Horn through LSSE in Amherst this Summer. CURTAIN UP: SUMMER ACTING WORKSHOP. For ages 11-18+ (6-12 grade). August 7-11, 2-5:30. Do you love to act? Are you longing to feel more confident and comfortable on stage? Want to practice your acting skills and learn new ones? Improve your comfort with improvisation and physical theatre. Learn audition skills and methods to help manage audition anxiety and stage fright. For all levels of experience, and taught by former professional actress and experienced drama teacher, Becca Greene-Van Horn. The acting exercises, drama games and scene work are designed to encourage young actors to take creative risks, while increasing their improvisational comfort level and self-confidence. Participants will increase their listening and collaborative skills, as well as verbal and physical confidence on stage. Fort River School. To register, call LSSE: 413-259-3065 or to www.lsse.org to register for summer drama programs.